Looking For A Baby Pasta Recipe? If you're looking for a baby pasta recipe, then look no further. Pasta is a wonderful dish, which perhaps lends itself most to creativity. Simply by changing the pasta shape, tweaking the sauce or swapping the sauce altogether, you have created an entirely new dish. And cooking with pasta is so forgiving that it makes a great dish for novices. It seems that all children love pasta – babies are no exception – and I have yet to come across one who doesn’t! This makes your job easier, as not only are pasta dishes so easy to make, but they are also filling, providing a satisfying meal for your little one. Pasta is perhaps universally associated with Italian food, although most people, Italian or not, probably have a favourite pasta recipe to hand. I have included a selection below, all of which have been successfully tried and tested on my son! These recipes are aimed at older babies, who have moved beyond single fruit and vegetable purees, and toddlers. Depending on the age of your child, you can substitute smaller or larger pasta shapes in the recipes, given how developed his eating skills are. And feel free to puree or mash the dishes to accommodate your little one. This is the ultimate comfort food - perfect for the whole family. A simple tomato pasta with added cheese appeal. Chicken makes for a nice introduction to lasagne, as the flavour of beef can sometimes be too strong for babies. A lovely alternative to fish pie, which is also a nice way to introduce baby to various kinds of fish. A quick and easy dish topped with grilled cheese. This stovetop macaroni dish is a nice medium to introduce spinach. 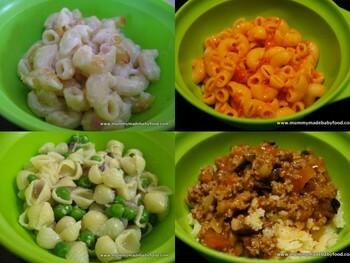 Most children will eat peas, and when paired with pasta, you have the perfect healthy combo! This dish seems to be popular with all children and is a nice way to introduce aubergine. Simple, tasty and such an easy meal to prepare. Most children tend to like pesto, and this variation is made with almonds instead of pine nuts.